After looking at the tanks for a few days i decided I was not happy with them. Just redid the small one. The wall sheets are now 120x240 scale centrimeters instead of 60x120 - now it looks less like brick. The top now has a spiderweb-like design of large sheets. Sorry, no pics, not building it again, the size stayed the same. You'll have to wait forthe final version. Finished all the tanks, and nearly completed the office annex pumping station. 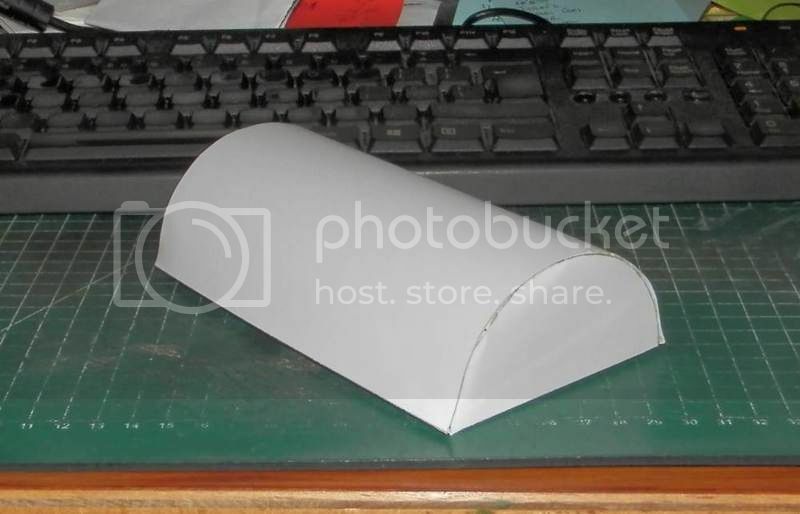 When that's done I'll still have to covert them to a better printable format - I draw in PCX format, and the print guy can't handle that - and add some pognant instructions. Went faster than I thought. 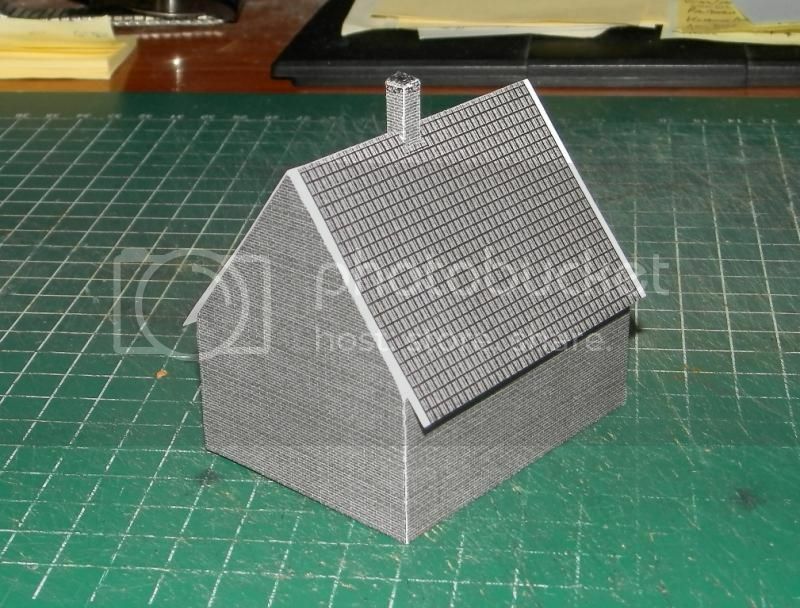 While the printer is putting the finishing touches to the tank farm I did some work on another long0suffering model, a Dutch detatched house. This is the second version. The first one was not as deep, but after I'ld printed out the sheet I noticed there was enough space lefyt over to add another 1.8 scale maters to the side walls. Might have to shorten the roof overhang a bit, one of the options is with a kitchen extension, that will still have to fit under it. 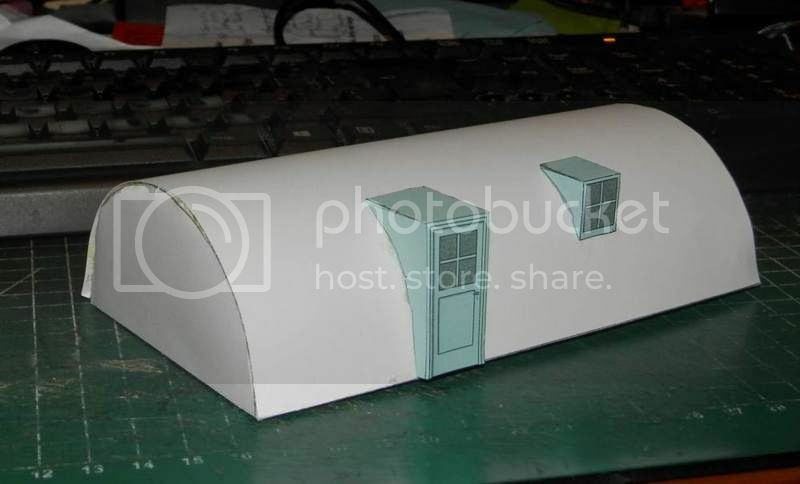 And yes, it will have doors and windows and stuff like that. I first considered selling them as an expensive options sheet, but I doubt the punters would go for that. Tank farm is done, I just finished the final build. Tomorrow they'll go on the webshops, in h0, N and Z gauges. Sorry for the bit crowded pic, my desktop just isn't any bigger. First model since my brain surgery. Since I still have some concentration problems it's a version of an earlier one. 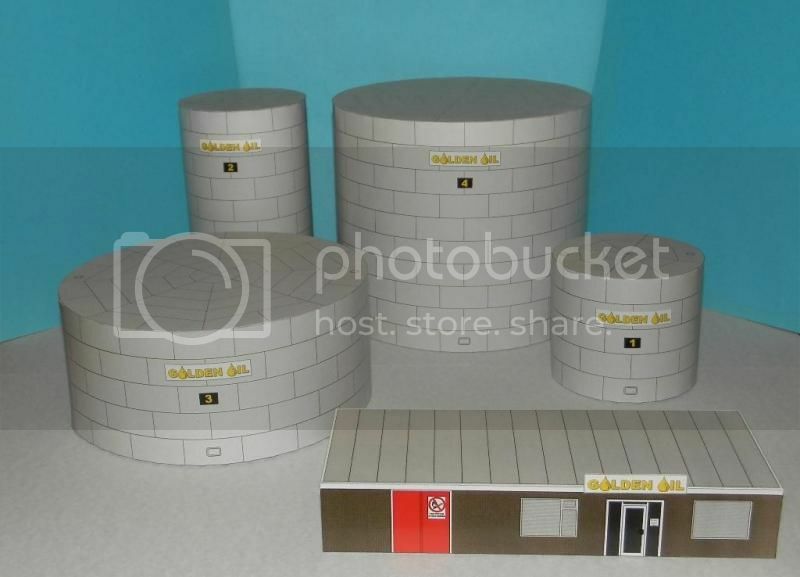 It will be available in the model railroad scales h0, N and Z. Nice to see you haven't lost your touch! 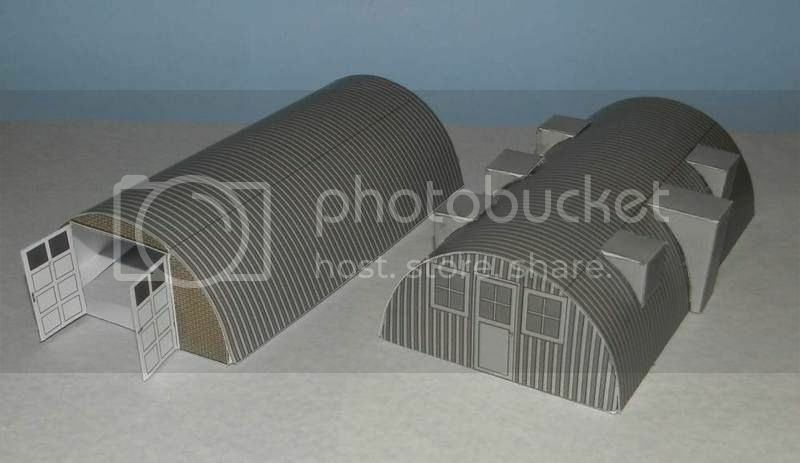 I'[m considering some Nissen huts, in both the smallest and tha largest of the three versions, in both military and civilian versions. 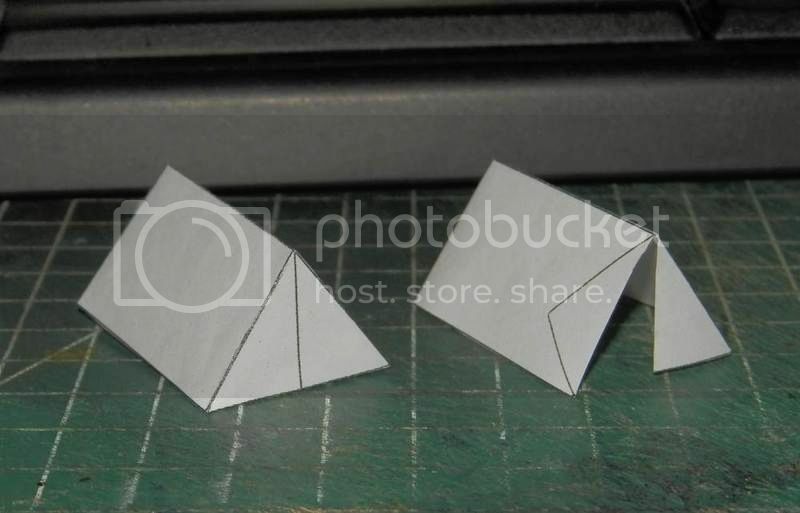 This is a proof-of-concept kinda testbuild of the smallest one in 28mm, to see if I got the proportions right. Still needs the bay-like side windows and door. 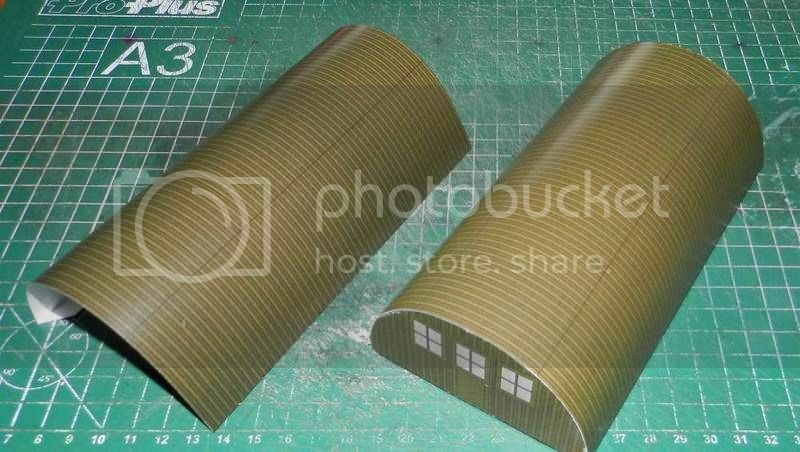 Made templates for optional side door and window. They fit. Don't pay any attention to the colour, I ran out of white paper in the correct thickness. 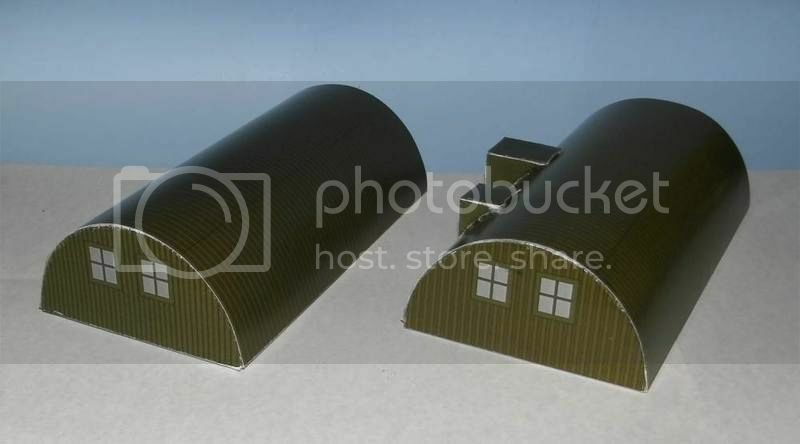 Beta build of the Nissen hut. As you van see I made the windows wider than in the first version. Since our printer is currently in Andorra - don't ask - and we only have a black and white printer, I used green paper to approximate the final result. 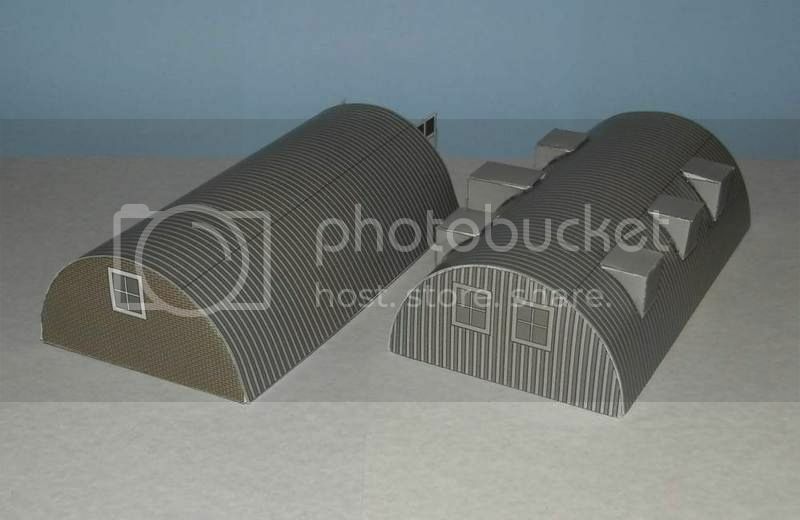 This one has corrugated metal end walls, there will also be optional wooden end walls. 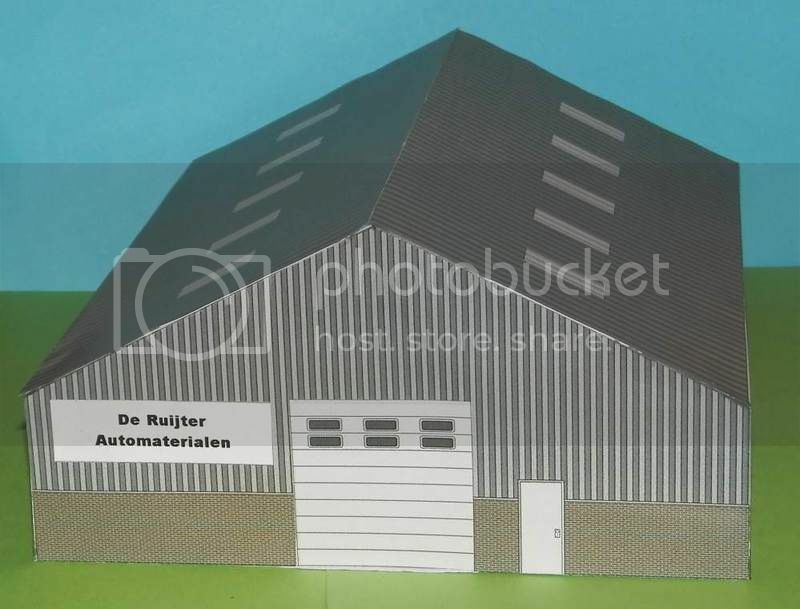 The grey version will come in two versions too: completely metal like this one or with brick end walls with wooden garage-type doors. All models will come with the optional side door and six bay windows, so many building varieties will be possible. The grey version is done, the final green version will follow soon(ish). Each set consists out of a roof, two sets of end walls, open and closed garage doors, a side door and six bay windows, so plenty of opportunities for customizing. 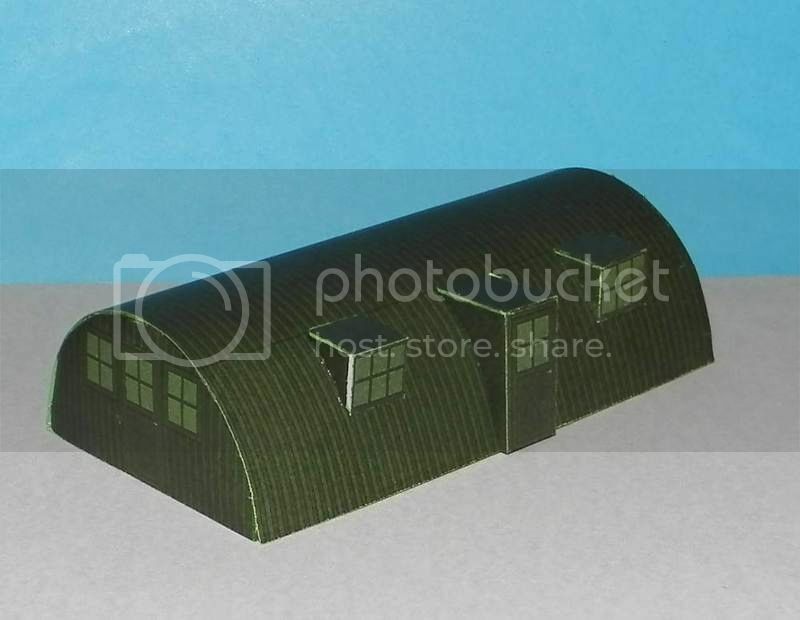 Finally managed to work a little on the final build of the small green Nissen huts. Far from finished, but progress. Got around to finishing the green version. Two varietes of end walls, corrugated metal and wood. Again, an optional side door and sixd windows are supplied with this kit. Army tents have ben on my to-do list for a long time, finally got around to doing one. The shape came out okay, the size less so. It was supposed to be 28mm, but as you can tell by the 1/72 figure next to it it came out more like 15mm. No prob, that can be fixed. I plan to do two versions: green for WWI and on, white for older periods but also for instance for Wild West colonist. 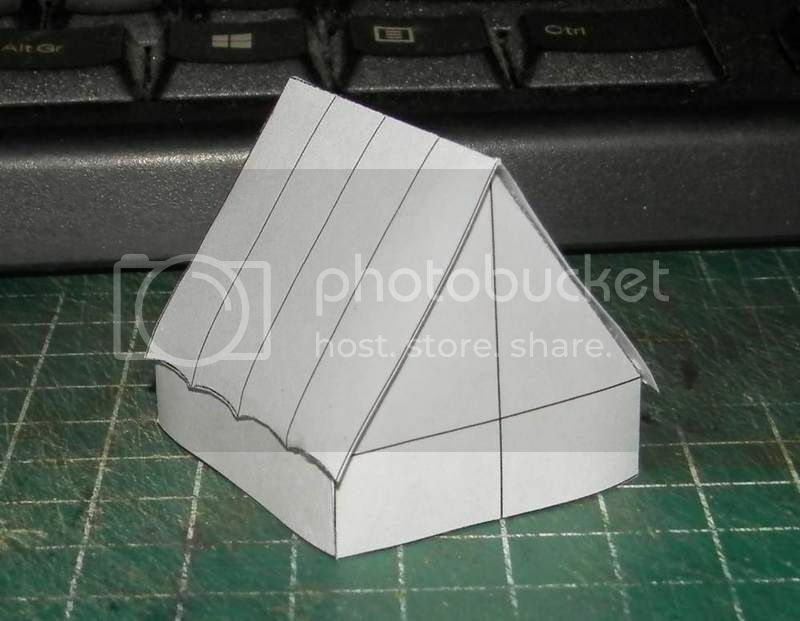 Regular A-shape tents will accompany this model eventually. 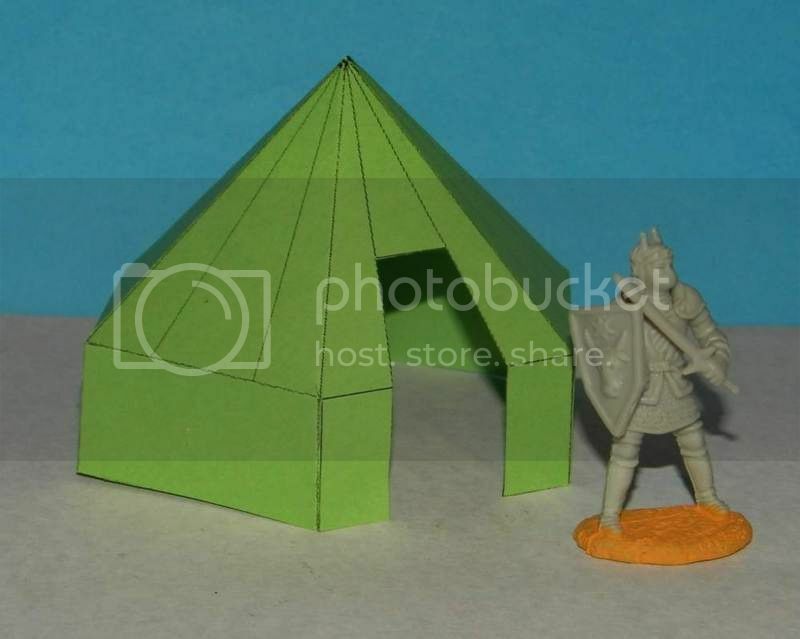 Beta build of tent A.
I had no suitable 28mm figures to go with it for scale, but luckily this heroic dude with the tin suit volunteered. All I have to add is a flap, and two more models. First draft of the second tent. Besides the two colours, white and green, there will be two versions: one closed and one with one open flap. Seriously doubt in. No idea what will be next, too many ideas - might pick one of those, or go with something totally else. 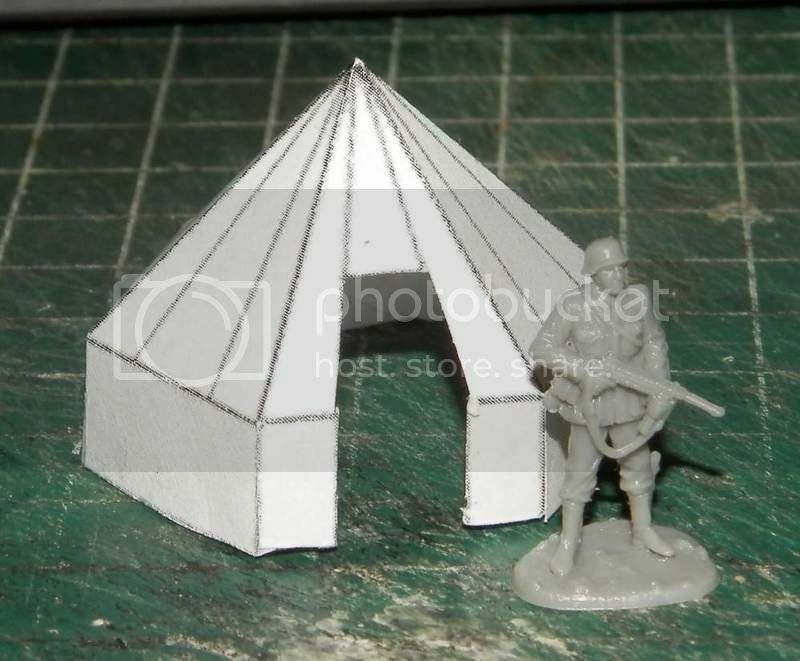 I've been looking at German tents, but the Splittermuster is discouraging. For the civilian side I've been collecting material for a concrete garage. 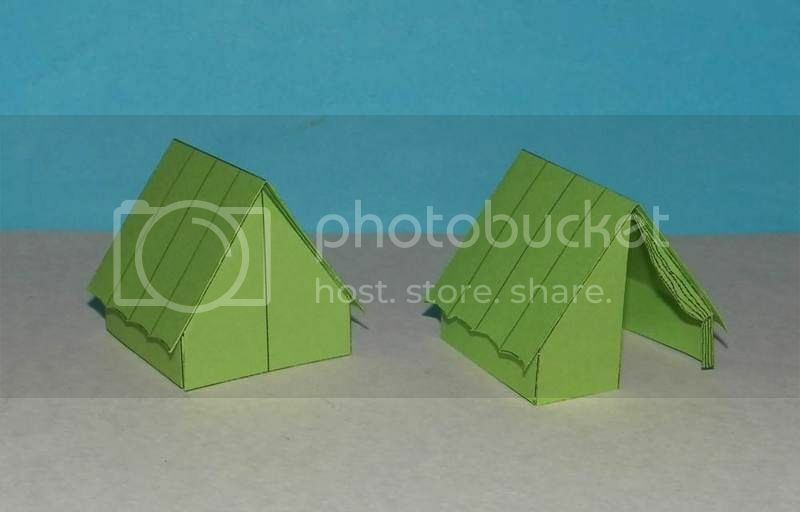 Beta-build of tent B, now all that remains is a small two-man tent, tent C.
I managed to find some slightly darker green paper, so I can print the final version on that. There will be a choice of scales, and white or green. Tent C. This simple 2-man tent is the tent equivalent of the T-34: cheap. simple construction, typical herd animal.